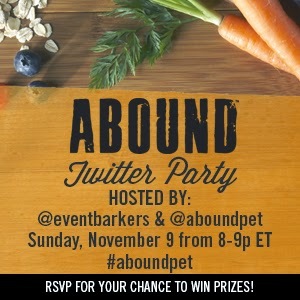 What a great time we had last night at the #AboundPet Twitter Party, sharing tips on healthy and tasty food and treats for our dogs and cats. ABOUND is the new premium brand of dog and cat food available at the Kroger family of stores. Everyone who attended learned about the healthy, natural ingredients that make up ABOUND, like chicken and salmon, blueberries and cranberries, and carrots and sweet potatoes -- the same healthy ingredients you might buy for your family to enjoy! As usual, we also had lots of fun seeing and sharing adorable photos of everyone's pets. Here are a couple of the cuties! Thanks to the folks at ABOUND, leading up to and during the party we gave away more than $750 in yummy prizes! To find ABOUND in your area check out this handy store locator. For more Twitter Party fun, sign up for the Event Barkers newsletter to make sure you don't miss a party! We have a few more on the horizon that are sure to be a great time! I participated and had a lot of fun, it was really fast paced and definitely kept me on my toes! Thanks so much for joining us last night! It sure was fast and fun, too!